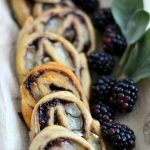 This easy baked brie appetizer recipe combines soft brie, blackberry jam, fresh sage, and crescent dough into easy-to-serve pinwheels. I’m an equal opportunity cheese lover, but when it comes to entertaining, there’s just something about brie. I think it’s the fact that it’s so versatile — it’s delicious whether it’s spread on a cracker, baked and melty, or sliced right off of the wheel. I’ve always enjoyed brie with fruit because the flavors combine so well, whether it’s my brie and grape quesadillas, or a slice of brie cheese on a cracker, topped with fig jam. This baked brie pinwheel appetizer is also very wine-friendly. It pairs perfectly with white wine at a summer-time picnic, and it would also pair nicely with a hearty glass of red at a holiday party. It’s a year-round party on a plate! If you haven’t had sage and brie together before, you’re in for a treat. Just spread out the crescent dough, and top with the jam. Layer the slices of brie in vertical rows to make it easy to roll up. Starting with the short end, carefully roll up the dough. Before you slice it, I recommend putting it in the freezer for about 30 minutes to allow it to harden just a bit. This will make slicing a LOT easier. Also be sure to use a very sharp knife when you’re slicing. Tip: The pinwheels may look a bit messy and flattened when you first slice them, but don’t worry. Once they bake, they will take shape and fill out into a more rounded pinwheel shape. An easy, but elegant brie cheese appetizer that pairs beautifully with wine. Line a baking sheet with nonstick foil. Place the crescent dough on top of the foil and smooth with your hands. 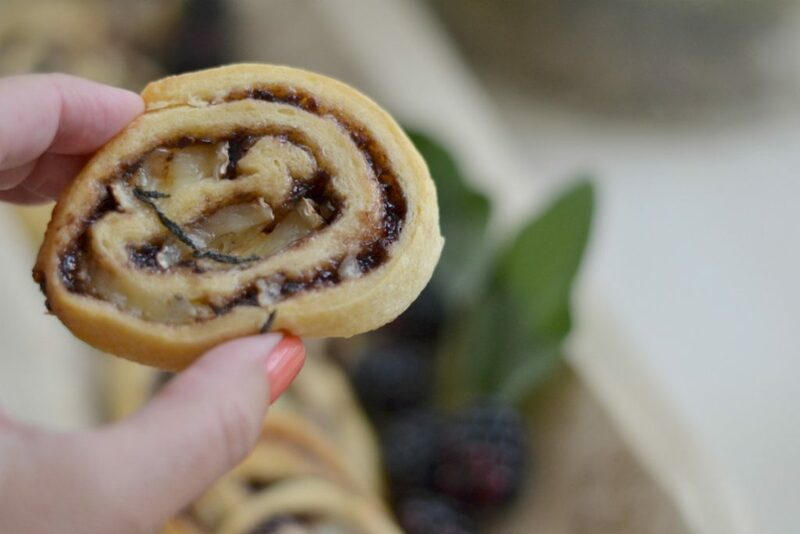 Spread the dough with a thin layer of blackberry jam, leaving a border on all sides. 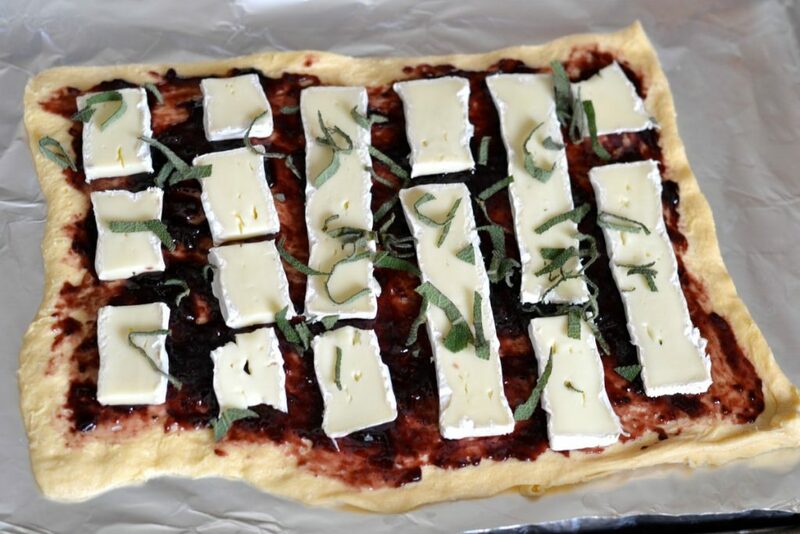 Cut brie into 1/4 inch slices and place in rows on top of the jam (you'll use about 2/3 of the wheel). Sprinkle sage on top of the brie. Starting at the short end, carefully roll up the crescent dough. Place the cookie sheet with the rolled up dough into the freezer for about 30-40 minutes to allow it to harden (this will make slicing easier). Using a very sharp knife, slice the roll into 1/2 inch slices. Place on cookie sheet, spreading apart to allow for expansion. Bake at 350 for approx 10 minutes or until the dough is cooked and just starting to turn golden brown. Allow to cool for 10 minutes before removing to a separate platter. Serve warm or at room temperature. Once the pinwheels cool, they are easy to pack up for a picnic, a potluck, or any sort of party on the go. They look so elegant that nobody will believe how easy they were to make. Love this recipe! I brought these to a picnic and they were enjoyed by all. I made this recipe two times. First time, they didn’t look so good but tasted great. Luckily that was just a trial run. Figured out where I went wrong so they were perfect the second time I prepared them for our event. I don’t recommend preparing this the night before. 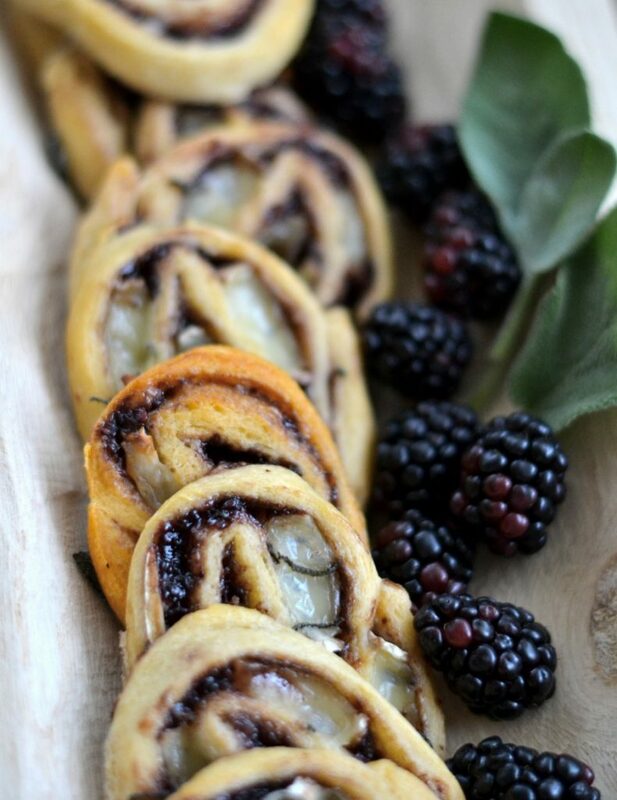 I’ve done that in the past with other pinwheel recipes but it doesn’t work well with the blackberry jam. It was oozing out and bottom of crescent was somewhat soggy and didn’t keep its shape while slicing, despite being properly chilled. First time, I could only find the perforated crescent rolls, made it work but it was a little trickier. Used the crescent roll dough (found it at Walmart) and was able to roll tighter so they formed better into pinwheel shape. Also, thinner slices of brie works best. Made them at home and weren’t eaten at the picnic until a couple hours later but they were just as delicious at room temperature. The combination of flavors is fabulous!